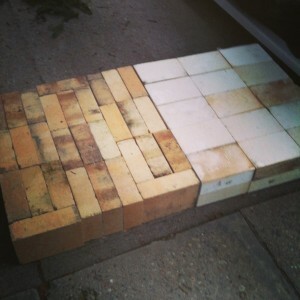 Picked up a number of fire bricks, and some insulation brick, in preparation for building a pizza/bread oven in the yard. Not sure 100% exactly what style I’m going to build – brick or cob/earth oven – but I came across this deal that was difficult to pass up. With what I have here, I should be able to have a cooking surface almost 36″ in diameter. If I decide to go the brick oven route, I can get more of the fire brick – shouldn’t need any more of the insulation bricks. Found an article on building a clay wood-fired oven – the approach used for the base may not be as permanent, but I like the simplicity. The materials are largely from a building supply – so pretty easy to get hold of, at a price. No cinder blocks used – just built up the base with urban rubble, sand, and some concrete. 10 bags of play sand (40 lbs. each) – used this in the base, filling in space between the rubble. 12 bags of jointers sand (80 lbs. each) – half was used for the dome form! 3 bags fire clay (50 lbs. each) – ran out while doing insulating layer – so getting a couple more bags. 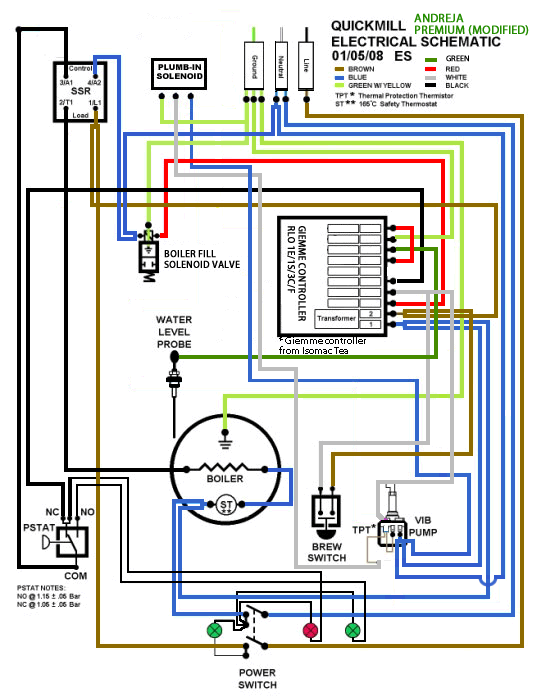 Andreja Premium schematic with non-standard control box. 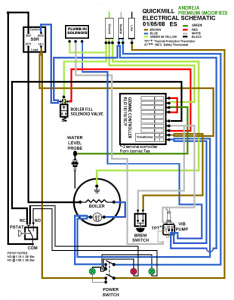 While I plan out what I’m going to do regarding the intermittent control box behaviour in my espresso machine, I decided that it would be helpful to update the electrical schematic for it – especially since its using a non-standard control box. The control box is actually one that is normally used in the Isomac Tea – a very similar machine to the Andreja Premium. I figured that I should do some other maintenance on the machine – having received a few grouphead gaskets from Espresso Planet, I figured I would replace that first. Last time it was replaced was a couple years ago, and it was a bear to remove, so I’m going to try and replace it a little more frequently. This was also a good time to clean the shower screen – which was quite plugged up. Replacing the grouphead gasket more frequently will allow me to clean this more frequently as well. 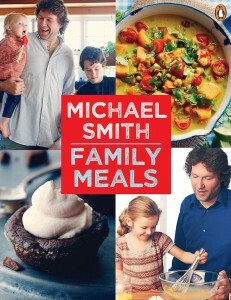 I won a copy of Chef Michael Smith’s new cookbook called “Family Meals” from Simplebites.net last week – and the book showed up in my mailbox today. Had a quick browse through – the raman noodle quick lunch and the broccoli tofu are on the menu later this week – and there are many more great looking recipes that I’ll be trying out soon! Thank you again SimpleBites! Checked out Amazon, and they’ve got a great deal on it – list price is $32.00! Click on the cover to the left to order a copy. Raspberry Pi + Andreja Premium? My Andreja Premium has been providing reliable service for the last 7 years – but just recently has been a little temperamental. Seems that the controller is overheating – and so for the past couple weeks, I’ve been running the machine without its stainless steel casing, and the controller sitting beside the machine. The controller was actually replaced once before, and it’s a fairly expensive repair – it was around $400 to replace the controller and descale the boiler. Don’t really want to spend that again – just to have the controller get wonky a few years later again. Not sure if this mod would be easily ported to the Andreja or not, or if this would even increase the reliability – but it sure looks interesting! Didn’t take any pictures, but made up a pile of pizza last night. Tried a different dough recipe that was really good – and used bread flour, which I think is a little finer than standard flour.